Teclast Master T8 review, a smaller version of the Master T10. MTK8173 Octa-Core, 4GB of RAM 64GB eMMC. Wireless AC and runs Android 7.0 Best price: $173.94 here https://goo.gl/epb79f with coupon F35AA4 Update: The screen does have a green tint on white images, I was wrong it’s not the screen protector! Anybody know what that last piece of bloatware actually does ? The one with the lock. Can I use a cell phone chip in this tablet ? How is it compared to the huawei mediapad m3 8? https://youtu.be/Y6qwOgpuXGw?t=2m18s This guy knows. I’m not sure why anyone would assume its a screen protector causing the horrible tint without investigating the issue. Especially when reviewing the tablet. Hey TechTablets.com have you had 2 minutes to investigate yet? Speakers on the same side doesn’t sound that good. The greenish look is not because of the protector. It is just like that. White is note white on this tablet unfortunately. Also the brightness is not good enough.. I feel very dissapointed buying this tablet. I have send this one back and bought a lenovo tab4 8 plus and I am very happy with it! An update on the screen tinting I mentioned in this review. Seems I got it wrong the affect looked like it was some sort of banding from the screen protector. But in the end it is the screen itself. Only visable on white backgrounds like the ebook I showed you or in white websites. Sadly its not fixable as far as I can tell. The Master T10 doesn’t have this issue and overall a brighter and better looking screen. Great review! What would you say is a good competitor to this for around the same price or maybe a few $ more? 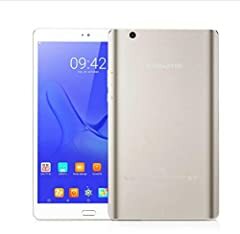 Not gonna lie this is a pretty decent tablet, but my ideal Chinese budget tablet is still the iFive Mini 4S which costs significantly less than this. Maybe when I have the extra cash to spend I’ll definitely spend it on the iFive Mini 4S. It’ll be great as a secondary device to switch to. A small tablet w/o GPS? These are great for navigation in a car/ truck. Don’t get this (it’s margin of course). did you know if the reason is the vulkan graphics library not supported ? can you try to install Asphalt 8 ? is this better than the lenovo p8 tab3? That test you do with the PDF … have you performed that test in a top tier tablet? I’d be interested to know how they perform differently (or if they do). I’m looking at a tablet primarily for having PDF documents open while I’m working but I need it to perform. This wasn’t too bad as I’m not generally flipping through them like I might in a textbook but I’m curious if it’s significantly better in a samsung or matebook tablet (ie: a high end tablet). Thanks again. no tablet will ever give bass, you mis lower end mid tones. What are the invidividual Antutu scores for the Teclast Master T8 (3D, UX, CPU and RAM)? I am trying to compare the graphics score with the Huawei MediaPad M3, since i need a tablet that i can run emulators on, and the M3 does seem to have a faster CPU, but i am not certain on which has the better GPU. Notebookcheck.net says the Mali-T880 MP4 is faster than the GX6250, but i would like to confirm that. I already ordered the Master T8, but since it takes a month before they ship it, and it reaches the price of the MediaPad M3 once i’ve payed import taxes, i might as well cancel my order, and go with the MediaPad M3 which i can get in my own country much faster. I have this product, this product is damn good ! Bought this one and looking better and works well. Don’t buy ifive mini 4s. How can I create a folder for apps?